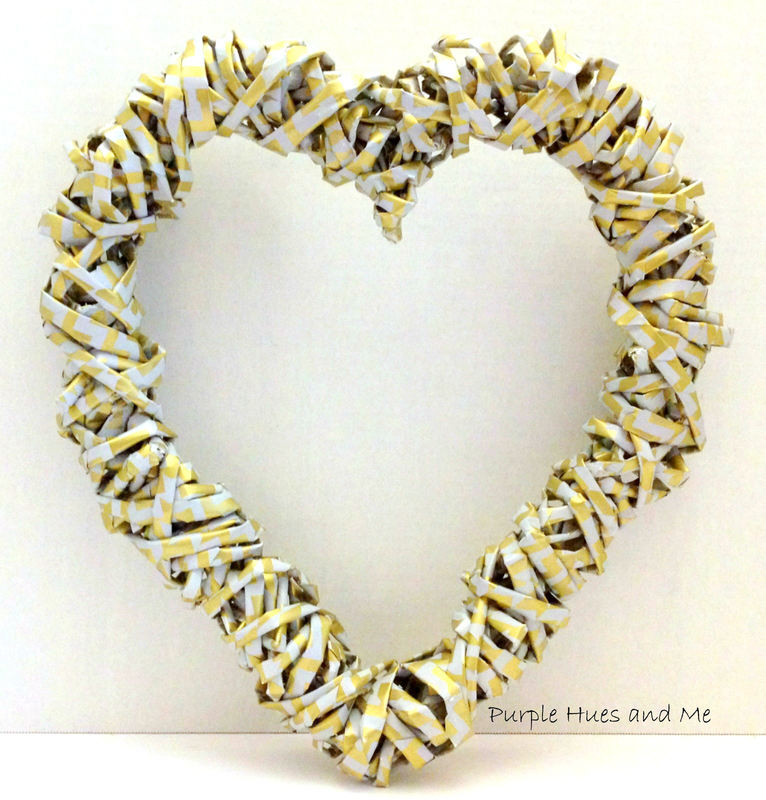 DIY A Non-Traditional Valentine - Make A Gift Wrapping Paper Heart! 1. 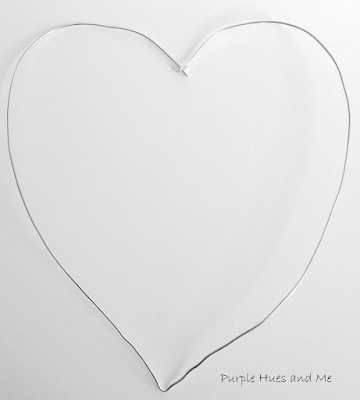 Cut off enough wire for the size of heart you want (14"x12"), bringing the ends together, curving the wire into a heart shape. To make the tubes (about 50 for this size), I cut 3" strips of 27.5" wide wrapping paper and placed a skewer stick on the corner edge of paper at an angle. Then wrapped the end tip of the paper over the skewer and started rolling the paper with fingers pressed down on the table first. Once you've started rolling the paper, lift up the tube so your left fingers are controlling the roll while your right hand is rolling the stick and tightening the tube. Just before finishing the roll, add tacky glue to the corner end tip and continue rolling until reaching the end to seal. 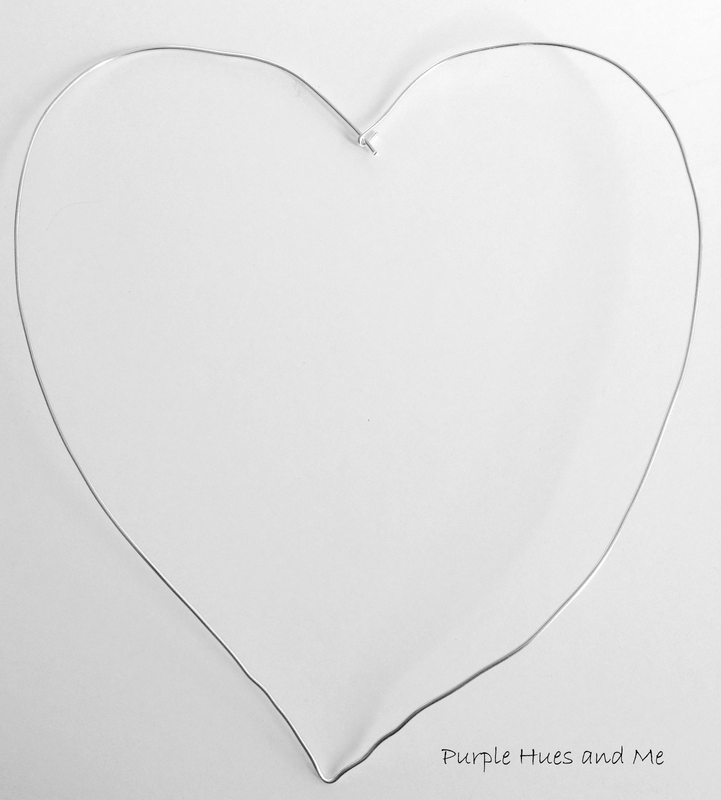 Temporarily straighten the heart shaped wire into a "V" to insert two tubes on either side . . .
and then re-shape into a heart. Glue the ends together at the center curve, and glue on another tube, as pictured. Begin wrapping the tube around the heart . . .
adding on additional tubes by dipping end into a little glue and inserting into the wrapping tube to make it continuous. You can clamp the tubes together while waiting for the glue to dry and continue wrapping. As you're wrapping the tubes around the heart go back and forth - and not in the same direction - until you're satisfied with the look and size. The end of the last wrapped tube can be glued and inserted down among the other tubes. Valentine's Day décor can be as unique and non-traditional as you want it to be. Just be sure to create it lovingly! Isn't that what makes it so special? this looks great, and it's probably a great way to use all excess wrapping paper leftover from the holidays! I wish you lived nearer. I tossed a can of wrapping paper out yesterday! This really crafty and cute. I love this I love non traditional! The sparkly gold is just perfect! Your come up with the cutest crafts. I love this. Gail, you are so gosh darn creative!! Everything you come up with just amazes me. This is really cute!! Pinned!! Stunning project, Gail!So unique!Love it! Thanks for sharing. That turned out really great Gail! So pretty! Such a clever idea. It turned out great! Thanks for sharing with SYC. A lot of work, but so worth it, my friend. I just love the way your heart turned out. Thanks for sharing with Roses of Inspiration. I hope to see you at the party tomorrow :) Hugs! Very nice! I love purple too. Thanks for sharing. This decoration idea is really and easy to use for any valentine party and I will definitely use it on celebration of Valentines next month. I have already hired event space San Francisco to surprise my girlfriend, though the venue doesn’t need so much decorations but I would love to use such small decoration details. Stopping by from Sunday's Best Linkup. I've sure missed your posts. I love this idea. It's rustic, but I'm thinking that reddish or red/white paper would change the look totally. Thanks for sharing and welcome back. Love it, Gail!! It is amazing what we can do with paper!! And I like it is no red for Valentine's... there are so many colors to show our love! Thank you SO much for sharing this at the Create With Me monthly party!! Pinned!! I'll be sharing later this week on social media too :) Beautiful job! Total funkiness I love your imagination and patience. I would have been crazed making 50 of those rolls. Gail, I love your Valentine's Day heart. Why? It is unique, it is an upcycling craft and it looks like a fun project to make in an afternoon.